Happy Friday! I told myself that after I overcame my writer’s block caused by having pity parties,I would be honest, transparent and vulnerable because sometimes baring it all helps with the healing process. I started thinking about what I have gone through in the past 5 years: graduating college, losing my father, relaunching my website and more recently, ending a situationship that was going nowhere. In the midst of all these events that have transpired, I felt myself not being able to talk to my friends about the things going on in my life. I felt disconnected from others and isolated myself because my goals and aspirations weren’t in alignment with theirs and we couldn’t relate to each other anymore. It was driving me crazy and I couldn’t figure out what had changed. Up until this week, I was still stumped but then it hit me. It wasn’t what changed but who and the person that changed was me. Once I had that epiphany simple but enlightening nonetheless, everything finally started to sense. One of the friendships that stuck out in my mind was the one I have with my best friend Felesha especially given our history. We met through an online Usher group back in 2001 (don’t judge us!) and connected instantly. We could relate to each other on so many levels from dealing with insecurities as far as our looks, “daddy” issues and of course our mutual love for Usher! We seemed to have so much in common so becoming best friends was inevitable. We were young and optimistic but over time, our differences started to overshadow the common experiences that helped our friendship blossom. She was very blunt, borderline rude at times while I could be overly sensitive and tried my best to think before I spoke. She grew up in a big family with many siblings and desired to have children. I only had my brother and the desire to have children decreased over time especially seeing how much work raising a child is after working in a daycare environment for over 7 years. She was content with having a minimalist middle class lifestyle that would be enough for her and her family. I on the other hand craved luxury and opulence and wanted wealth more than starting a family. These are a few of the differences that stood out to me after an emotional conversation we had a few months back after being offended by her tone and language. I wondered what happened to my best friend that I was so close to. Why did I no longer feel like I could talk to her about things going on in my life without feeling judged and criticized because we had different perspectives on how the future should be? Was she always this way but youth and naivety blinded my vision or was it just a matter of time before life and our own unique experiences would leave an imprint that would forever change the course of our friendship? Whatever it was, I knew that things had changed but what I didn’t realize until this epiphany was that I placed a lot of the blame on her instead of admitting that I was also at fault. Ultimately it came down to realizing that we both changed because change is inevitable. We can’t think and act like the teens we were when we met because there would be no growth or progression. Life experiences mold us into unique individuals and the traits that may be seen as negative in some aspects can also be seen as positive depending on the situation. I realized that I needed to let go of the young girls we once were and work on strengthening the friendship between the women we have become. It’s still a work in progress (see what I did there!) but I have a feeling that our friendship will survive the test of time because we are able to see things as they are and not what we imagined them to be when we were young. That clarity has made me love and appreciate her even more than I did before. I saw a quote on Facebook that really resonated with me that said “When you begin to truly trust and like yourself, you tap into an immense amount of power.” I am learning to trust myself and love myself and embrace the stronger, outspoken woman who I am becoming. Becoming that woman means accepting harsh truths and understanding that I can’t be the person I used to be. The goals I want to achieve requires me be greater than I used to be while still remaining true to the essence of who I am. 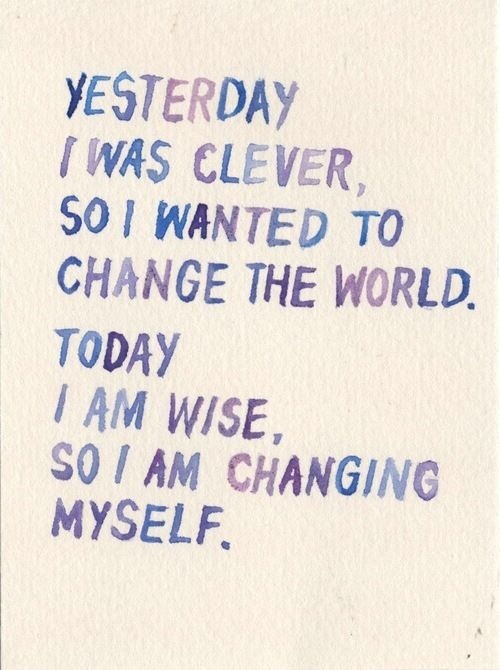 I can finally accept that I have indeed changed and can honestly say it is for the better!